Consumer durables are expected to continue their sales expansion in 2018, although at a lower pace than in 2017 as private consumption growth slows. In 2017 consumer durables sales continued to grow driven by robust GDP and private consumption growth (up 3.1% and 2.4% respectively), improved consumer confidence, low inflation and increased availability of consumer credit. Consumer durable goods are expected to continue their sales expansion in 2018, although at a lower pace than last year, as private consumption growth is expected to slow down somewhat, to 2.1%. Profit margins in the consumer durables retail industry have generally remained stable in 2017, and this development is expected to continue in 2018. External indebtedness is not overly high in this industry, as businesses generally do not make large investments, while their financing needs are mainly tied to working capital. 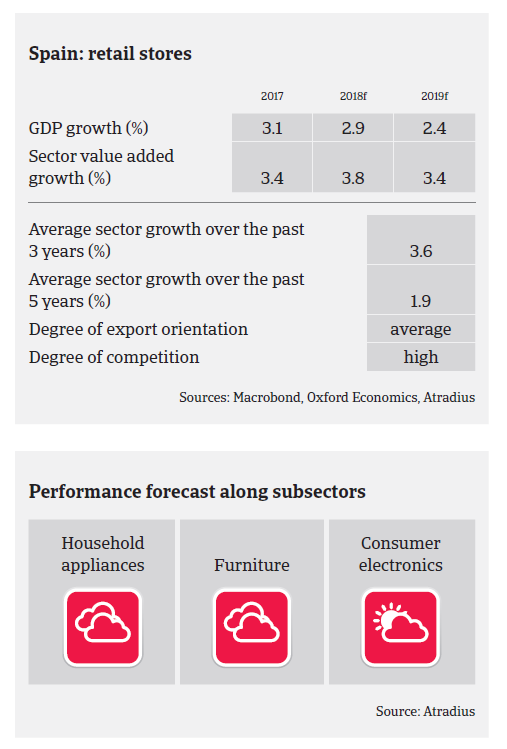 Competition in the Spanish consumer durables sector remains high and will increase further over the coming years. E-commerce businesses will continue to expand their market share, while the main players will continue developing strategies focused on improving their digital positioning. On average, payments in the sector range from 60 to 90 days. Payment behaviour in all major subsectors (household appliances, furniture, consumer electronics) was relatively good in 2017, and no major changes are expected, as the general performance outlook remains positive. Consumer durables retail insolvencies are expected to decrease by about 5% in 2018. Our underwriting approach remains positive for the consumer electronics segment, while it is neutral for household appliances as in this segment e-commerce competition could have a significant impact on local and small retailers in the short-term. Despite growth over the last couple of years, our underwriting stance on furniture is also neutral, as this subsector is closely linked to construction performance and large retailers put pressure on their smaller peers.